Did you ever look carefully at a venetian mask? I must admit I did not, at least until some years ago. Even though I was born and live in Veneto. I kind of took them for granted, like the sun in the sky. Yes, it is true,sometimes we don't care about masterpieces down in our backyard! Do you not see the aura of mystery, the magic, something kind of romantic and lustful at the same time? I did, the first time I watched and not only saw it. Until then, I did not even think of its amazing history . Have you ever watched the 1999 Stanley Kubrick's movie entitled Eyes wide shut, starring Nicole Kidman and Tom Cruise? At one point, you see a masquerade ball, and masks all around worn by every participant, in a luxury palace, where only few selected people were allowed to attend. Well, people at this ball were wearing some authentic venetian masquerade masks. Stanley Kubrick went in Venice to personally sort out some of those handicrafts. One of the reasons why I find the venetian mask full of magic is that I can not help but think about its origin. I imagine them worn by the Venetian people in their everyday life, back in the early centuries of the last millennium. 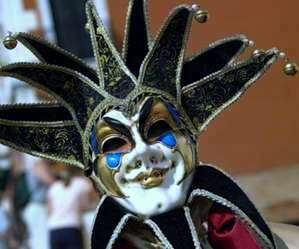 As it's interesting to know that the venetian mask was used in this Veneto's town way before Carnival and regardless of it. We usually think of those handicrafts as mere carnival masks, and peculiar to this particular time of the year. We are used to seeing them worn by people from all over the world, parading in the streets of Venice, celebrating the short Carnival period (Carnevale). Sometimes they hang on the wall or are placed upon a piece of furniture as an ornament. 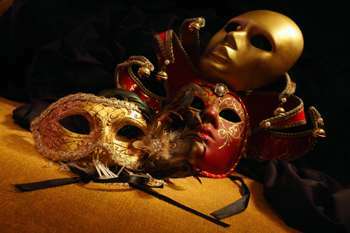 In a word, nowadays they are right only for a venetian masquerade, masks to wear only during celebrations and parties. But their origin is different..
Actually, wearing masks has always been a central feature in the Venice daily life, way beyond the carnival days. 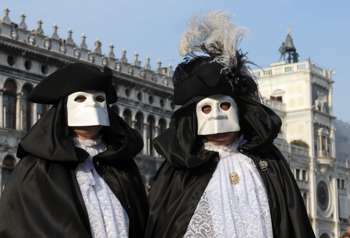 They would play a very important role in social relations, as wearing a mask has been for centuries a common practice among ancient Venetians, from average citizens to the aristocrats. It was considered a very odd practice out of Venice, yet it was much accepted, sometimes even made compulsory by law in this lagoon town! The history of the venetian masks, and of their social meaning in daily life, is really amazing because of its oddity and peculiarity. The authentic venetian masquerade masks are handmade using a paper-mache technique. The mask-makers - Mascareri in venetian- create them from a plaster cast. The cast is often a single, exclusive creation of the very mask-maker, meaning that he/she has kind of a copyright on it..
..in fact every mask is like a masterpiece that can be duplicated only by using the cast it stemmed from. They fill the cast with layers of a special absorbent paper carefully pressing and shaping it into the mould. After shaping it, the mask-maker places the mould in the special oven in order to help it dry. Once dried, the mask is taken out the cast, then varnished, waxed and cut in the eyes area. Finally the complex decoration with different materials begins: bright colors paint, beads, lace, feathers, jewels, metal, and in the most refined ones precious Swarosky crystals too. It is the most significant one in the history of the venetian mask: it was about hiding your own identity during the everyday life in the Repubblica di Venezia. This is a very peculiar one, a weird and mysterious character with a mask covering the whole face, with a very big jaw, and no mouth. It was worn both by men and women. Often this face mask was worn along with the typical Venetian hat, that was a three pointed black tricorno, and a long black cloak called tabarro, with a zendale (kind of a shawl) over the shoulders. This is kind of a grotesque character, also one of today's most popular and bizarre carnival masks, with a unique and macabre origin. This disguise was worn in Venice during the plague period by doctors, in order to protect themselves from the disease, by avoiding any physical contact while treating people afflicted with plague. This disguise covers the whole face and neck. It's kind of a white balaclava with a long beak on it, with crystal eyes as further protection. A black hat, white gloves, a long black cloak and a stick complete the ominous picture. Out of the most typical women's Venetian masquerade masks. Very elegant, with expensive clothes and jewels on. This black oval shaped Venetian mask was one of the womens favourite disguise all year around. It was secured to the face by a small button. Also named Jolly, it is typical for its floppy six pointed hat. Another distinctive feature of the Jolly is its constant laughter. There are some characters of the ancient Art Comedy -Commedia dell'Arte- which have become carnival masks too. These theatrical masks were typical of the italian improvisational theater dating back to 16th till 18th century. The actors used to perform conventional situations and farcical characters, like the servant, the doctor, the jealous, the villain, the moron, etc., often representing not only a category or a type, but a town or a region too. Arlecchino: he is a servant. He wears a chequered costume, he's very agile and continuously jumps all around. I once worn this costume back in the days, when I was a child! Pantalone: he represents the archetypical merchant of Venice, old, very talkative, lustful and stingy. 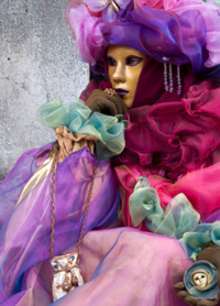 Colombina: another typical venetian mask, she's the young servant of Pantalone, and engaged to Arlecchino. She's smart and quick.